A new champion of prog has been found. Roel van Helden is – for those who don’t recognize the name – a drummer, who has over the years been in various bands and played many different genres. Beginning in punk rock acts with his brother, he then, once he discovered Dream Theater, Symphony X, Nevermore and the like, started to change his drumming style to a more complex one and went on to study music at the Fontys Conservatorium in Tilberg. Here his musical horizons were broadened even more by playing everything from jazz to pop to funk. After he left the Conservatorium, he formed the band Delphian with guitarist Coert Bouten and released two albums with them before that band broke up. Since then Roel has been sitting on the drum stool for those two wonderful progressive metal bands Sun Caged and Subsignal. Roel couldn’t just sit still and be content with being the drummer for those bands, however, so he set about writing, recording and producing his very own progressive rock album. And if you’re a fan of any of the acts already mentioned then you’re in for a treat. 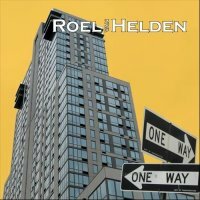 Roel himself handles all of the drums plus some of the keyboards, guitars and timpani and then – where this album starts to get really interesting – is the way Roel has utilized the talents and strengths of his many friends to help out with his musical vision. These talents include Arno Menses, Bob Paulus, Paul Adrian Villareal, Aniek Janssen, Marcel Coenen, Coert Bouten, Rene Kroon and Jos Severens; and these artists and many more have breathed life into a very strong set of songs, that only get better on repeated plays. Opening and closing the album we get two very addictive instrumentals called ‘130 Thousand Miles’ and ‘The 4th Dimension’, which showcase the wonderful musicality of the songs van Helden has written; ‘130TM’ being especially good and I always find my finger hovering over the repeat button just as it finishes playing. The first song proper ‘The Long Road Ahead’ sees Subsignal vocalist Arno Menses take up the microphone and the combination of van Helden’s thoughtful and emotive song writing joined with one of the great singers of Prog rock is a sheer joy to hear. From here on in each track features a different singer, though that isn’t a problem because the song writing of van Helden compliments each of the vocalists abilities and because of this, each track is of the highest quality. Songs like the powerful ‘No More Silence’, ‘Break The Glass’, ‘I Wonder Why’ and ‘No Sense Of Ease’ are all big slabs of intricate and thoughtful prog rock, that shun the fact that they are taken off someone’s debut album. Prog lovers really should check this album out forthwith and I just hope Mr van Helden continues to make solo albums because if this CD is anything to go by, a new champion of prog has been found.